Did Public Television Commit Self-Censorship to Appease Billionaire Funder David Koch? 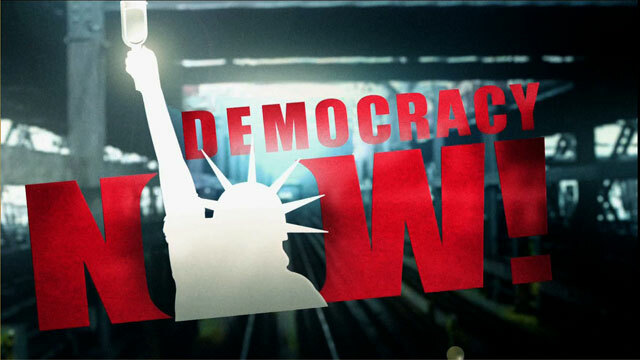 | Democracy Now! Did Public Television Commit Self-Censorship to Appease Billionaire Funder David Koch? co-director of the forthcoming film Citizen Koch. Her 2008 film Trouble the Water was nominated for an Academy Award. co-director of the forthcoming film Citizen Koch. His 2008 film Trouble the Water was nominated for an Academy Award. Filmmakers Tia Lessin and Carl Deal say plans for their new documentary to air on public television have been quashed after billionaire Republican David Koch complained about the PBS broadcast of another film critical of him, “Park Avenue: Money, Power and the American Dream,” by acclaimed filmmaker Alex Gibney. Lessin and Deal were in talks to broadcast their film, “Citizen Koch,” on PBS until their agreement with the Independent Television Service fell through. The New Yorker reports the dropping of “Citizen Koch” may have been influenced by Koch’s response to Gibney’s film, which aired on PBS stations, including WNET in New York late last year. “Citizen Koch” tells the story of the landmark Citizens United ruling by the Supreme Court that opened the door to unlimited campaign contributions from corporations. It focuses on the role of the Koch-funded Americans for Prosperity in backing Wisconsin Gov. Scott Walker, who has pushed to slash union rights while at the same time supporting tax breaks for large corporations. The controversy over Koch’s influence on PBS comes as rallies were held in 12 cities Wednesday to protest the possible sale of the Tribune newspaper chain, including the Los Angeles Times and Chicago Tribune, to Koch Industries, run by David Koch and his brother Charles. JUAN GONZÁLEZ: Rallies were held in 12 cities Wednesday to protest the possible sale of the Tribune newspaper chain to the Koch brothers, the billionaire backers of the tea party and other right-wing causes. The Koch brothers are reportedly considering making a bid for the newspaper chain, which would give them control of two of the 10 largest newspapers in the country, the Los Angeles Times and the Chicago Tribune, and two key papers in the battleground state of Florida, the Orlando Sentinel and the Sun Sentinel in Fort Lauderdale. Others papers include The Baltimore Sun and the Hartford Courant. A deal could also include Hoy, the second-largest Spanish-language daily newspaper. According to The New York Times, the Koch brothers have quietly discussed purchasing media outlets as part of a long-term strategy to shift the country toward a smaller government with less regulation and taxes. This is Justin Molito with the Writers Guild of America East at Wednesday’s protest in New York City. JUSTIN MOLITO: Today we’re out here calling on the equity firm that has stakes within the Tribune Company to not sell to the Koch brothers and not have the L.A. Times, The Baltimore Sun, the Orlando Sentinel and other publications go the way so much of the rest of our media is going, which is under corporate control. And to see that what’s happened recently with the Citizen Koch film should be a warning to everybody in this country that consolidation of corporate power and a free press do not mix in what should be a democracy. JUAN GONZÁLEZ: Well, what happened to the Citizen Koch documentary he refers to is what we’ll look at today. The film tells the story of the landmark Citizens United ruling by the Supreme Court that opened the door to unlimited campaign contributions from corporations. It focuses on the role the Koch brothers-funded group Americans for Prosperity played in backing Wisconsin Governor Scott Walker, who was pushed to slash—who pushed to slash union rights while at the same time supporting tax breaks for large corporations. Citizen Koch was set to air on PBS next fall until its agreement with the Independent Television Service fell through. AMY GOODMAN: The story of how this happened is detailed in a piece published last week in The New Yorker magazine. Written by Jane Mayer, it’s headlined “A Word from Our Sponsor: Public Television’s Attempts to Placate David Koch.” It begins by describing another film critical of the Koch Brothers that did air on PBS, Academy Award-winning director Alex Gibney’s documentary, Park Avenue: Money, Power and the American Dream, which contrasted the lives of residents who live in one of the most expensive apartment buildings in Manhattan, 740 Park Avenue, with those of poor people living at the other end of Park Avenue, in the Bronx. This is a clip from that film. NARRATOR: This stretch of Park Avenue on the Upper East Side of Manhattan is the wealthiest neighborhood in New York City. This is where the people at the top with the ladder live, the upper crust, the ultra-rich. But this street is about a lot more than money. It’s about political power. The rich here haven’t just used their money to buy fancy cars, private jets and mansions; they have also used it to rig the game in their favor. Over the last 30 years, they’ve enjoyed unprecedented prosperity from a system that they increasingly control. To pick up the rest of this story, we’re joined by the film Citizen Koch's two directors, Tia Lessin and Carl Deal. Their 2008 documentary Trouble the Water was nominated for an Academy Award. It was about Hurricane Katrina. They also worked on Michael Moore's films Bowling for Columbine and Fahrenheit 9/11. We reached out to WNET and ITVS, but they declined to join us on the show. We’ll read the statements they sent and play clips from the film Citizen Koch. But first, we welcome you, Tia and Carl, to Democracy Now! TIA LESSIN: Thank you so much. AMY GOODMAN: So, why don’t you tell us about what’s happened to your film? We saw you at the Sundance Film Festival. We always cover the documentary track, and your film, Citizen Koch, was one of those that was premiering at Sundance. Tia, what happened next? And, you know, we were sort of stunned. We were open to other names, you know, quite frankly, but we were really curious about what was behind that. And, look, it took one Google search to figure out that David Koch was a board member of WNET and GBH also, and also a contributor. So we asked, very directly, “Did this have anything to do with the demands they were making?” And, you know, they were not very transparent, but it became clear that, in fact, there was a climate at PBS that would find the name of this film, Citizen Koch, unacceptable. And we told them, “Look, we’re happy to change the name, but not for political reasons. We’re not going to change the name of our film because one of your donors is going to be angered by it.” So, we took a principled stand. We thought that everything would fall apart then and there. We went to Sundance, and they told us before Sundance, “No, we’re still committed to your film. We’re on board with you. We want to see you through this. And we’re still in partnership.” So, that’s where the story left off. JUAN GONZÁLEZ: And, of course, the Jane Mayer article in The New Yorker has pointed out the key role played by Neil Shapiro in beginning to exert pressure on ITVS. Of course, Neil Shapiro had a long career as a network executive at NBC before he came over to run the duopoly, the PBS duopoly in New York. But did you, at that time, get any indication Neil Shapiro was directly intervening? TIA LESSIN: Look, they weren’t being completely honest with us. They—it was clear that they were afraid of something and somebody. What we now know from Jane Mayer’s article is that Neil Shapiro called ITVS directly and issued some threats, including that they would—that NET would pull out of their series Independent Lens in the aftermath of that Gibney film. And so, I guess they saw our film coming down the pike and freaked out, you know. And it wasn’t just that they wanted us to change the title of the film. It became clear that they wanted us to get—you know, to sanitize the film, to scrub Koch out of the film altogether. AMY GOODMAN: Carl, can you explain the relationship between ITVS—explain what ITVS is and what PBS is, because you weren’t automatically going on WNET or PBS, but it was your funding and your distribution? CARL DEAL: Yeah, yeah. The Independent Television Service is—exists to support, financially support, the work of independent filmmakers, and then to advocate for those films that it supports to go on the air on a number of different ways, including their flagship series, which is really the premier showcase for high-quality documentary films, Independent Lens. And so, they have—they’re publicly funded. As far as the way we understand it is their entire budget comes from tax dollars. And, you know, so, they’re good people who have a very, very important mission. And we were really hopeful when all this was going down that they would join with us. We’re willing to fight for this film, and we want people to advocate for it alongside us. This isn’t a film—this isn’t an exposé of the Koch brothers. This is a look at how big money and the money of—ideologically driven money from the wealthiest Americans is drowning out the rest of us. JUAN GONZÁLEZ: Well, I wanted to ask you about the ITVS response. JUAN GONZÁLEZ: We invited someone from ITVS to appear, but they declined. But they did issue a statement. They said that, quote, ”ITVS initially recommended the film Citizen Corp for production licensing based on a written proposal. Early cuts of the film, including the Sundance version, did not reflect the proposal, however, and ITVS eventually withdrew its offer of a production agreement to acquire public television exhibition rights. The film was neither contracted nor funded” by ITVS. Your response? CARL DEAL: Stunning. Stunning. We were really disappointed, that we have an opportunity right now for ITVS to engage in a really important conversation about who has influence over what goes on the public airwaves. You know, PBS was set up, the Corporation for Public Broadcasting, to serve the public interest, not private interests. And so, we’re really disappointed with that statement, because when ITVS came in and decided to become a production partner with us, we were a year into production. We had our characters cast. We had our story lines. We presented them with written proposals, with video proposals, that completely reflect the film that we delivered. The only thing that changed, from the time that they saw a rough cut of the film and the time we got into Sundance and these series of strange meetings started to happen, was Alex Gibney’s film aired. AMY GOODMAN: Well, we asked both ITVS and PBS to join us. Let me read the response, the statement from the New York PBS station WNET that aired the Alex Gibney documentary, Park Avenue: Money, Power and the American Dream, last November, but drew criticism for giving David Koch advance notice and running his response immediately after the film, along with a round table discussion. They did decline our invitation to come on the program, but wrote, quote, “We have previously used round table discussion segments to expand on programming covering controversial topics, and we invited Mr. Koch and Senator Schumer (the two main characters in the film) to participate.” The statement also said, quote, “With regard to the film 'Citizen Koch', no one at WNET knew anything about this film and never had any discussions about it with ITVS or any other entity.” Your response to that, Tia Lessin? TIA LESSIN: I have no doubt that NET, you know, saw it—didn’t see it. I mean, I don’t think Koch saw it. That’s how insidious this is. You know, David Koch doesn’t need to pick up the phone and yell at anybody. He just has to tap his wallet, and, you know, our film disappears. AMY GOODMAN: In fact, he did quit the board. He resigned from WNET just a week or two ago. AMY GOODMAN: And was a major donor, what, has overall given something like $23 million. TIA LESSIN: That’s right, tax-deductible dollars, you know? And in exchange for that, apparently he has some role in programming decisions over at NET, and I think that’s really unacceptable. JUAN GONZÁLEZ: So, in essence, what we’re looking at here is not necessarily a direct intervention by Koch, but self-censorship by the public television community in an effort to prevent someone like Koch from pulling their dollars out. TIA LESSIN: That’s right. That’s right. TIA LESSIN: Well, and, actually, I think why does somebody like David Koch make such a major contribution to public broadcasting, when in fact he’s against public institutions like public broadcasting? I think it probably has to do with having some influence over what gets said on the public airwaves. AMY GOODMAN: You were at the protest yesterday here in New York. There were protests around the country around the issue of the Kochs buying newspapers like the Los Angeles Times. What connection do you see here, Carl? CARL DEAL: Well, look, we didn’t enter into this conversation lightly, but our experience, we feel that our film was censored, and it was due to the presence of David Koch on the board. And there’s a lot of discussion right now over whether or not private ownership of newspapers has an influence on how the news gets reported. And we just feel like our recent experience sheds light on that. If there were ever any doubts, in this case, whether or not David Koch directly intervened, his mere presence had an impact on the public discourse. AMY GOODMAN: We’re going to break, and then, when we come back, talk about the content of your film, Citizen Koch. This is Democracy Now! Back in a minute. AMY GOODMAN: This is Democracy Now!, democracynow.org, The War and Peace Report. I’m Amy Goodman, with Juan González. Let’s turn to the trailer of a new film, a new documentary, called Citizen Koch. It’s produced, directed by Tia Lessin and Carl Deal, the Academy Award-winning filmmakers we’ve been speaking with. This is the trailer. PROTESTERS: Kill this bill! Kill this bill! Kill this bill! Kill this bill! UNIDENTIFIED: If you want to look at how the wealthiest interests are warping politics, there is no better place to look than the state level. DAVID KOCH: Money is a weapon. NEWS ANCHOR: More than $3.5 billion has been spent, making this election the most expensive on record. DIANE HENDRICKS: Any chance we’ll ever get to be a completely red state? DIANE HENDRICKS: What can we do to help you? UNIDENTIFIED: The Koch brothers own a number of companies, refineries that specialize in some of the worst types of oil. INTERVIEWER: How much have you put into Wisconsin? TIM PHILLIPS: Since January of last year, just over $10 million. GOV. SCOTT WALKER: Wisconsin is open for business! BUDDY ROEMER: You know, the first question people ask me, “Governor, why haven’t you been on a debate?” You have to raise a half a million dollars in the last 90 days. What kind of country are we? MITT ROMNEY: Rick, I’ll tell you what, 10,000 bucks? MARI JO KABAT: I am a Republican. I don’t think the party represents what it used to represent: the common man. RETIREE: If it wasn’t for the union, I couldn’t have retired. REP. GWEN MOORE: You started out giving $117 million worth of tax break to wealthy people and, in contrast, doubling the taxes on the poorest parents. UNIDENTIFIED: Wisconsin is where the people were overpowered by money. JAMES BOPP: You cannot even buy a Democrat congressman for $2,500. A Republican congressman seems to take more: $140,000 plus a yacht. UNIDENTIFIED: The highest court in the land has the lowest ethical standards. UNIDENTIFIED: This is really about to find a way to spend money in elections without telling anyone who you are. INTERVIEWER: And why would you want to do that? UNIDENTIFIED: Well, that’s a good question. SARAH PALIN: Mr. President, game on! UNIDENTIFIED: Bust the unions, it’s over. UNIDENTIFIED: It’s a power grab to change not only the rules of the game, but to take us out of the process altogether. UNIDENTIFIED: This is an agenda that the less than 1 percent wants. UNIDENTIFIED: I can’t hire a lobbyist to lobby my causes in Washington. A lobbyist is not in my budget. PROTESTER: Kill the bill! Kill the bill! Kill the bill! PROTESTER: This can’t happen! This is wrong. UNIDENTIFIED: They’re just going to keep crushing the middle class, crushing the poor people. COUNTY WORKER: And I’m losing my benefits. GLENN BECK: I want to thank Charles Koch. REPORTER: Don’t the Kochs own six paper factories and an oil pipeline in Wisconsin? SPOKESPERSON: I’ll take another question. BUDDY ROEMER: Listen to me, America. You’re unimportant. They don’t care about you. Because you don’t bring a check. PROTESTER: If you never voted before, I bet you will now. AMY GOODMAN: That was the trailer of Citizen Koch, a new documentary that was in discussion to air next fall on PBS, until the agreement the directors had with Independent Television News fell through, as we just discussed. But we’re going to talk about this film right now. It begins with Citizens United. Take us from there, Carl Deal. CARL DEAL: Well, Citizens United was the Supreme Court decision in January of 2010 that basically opened the floodgates for corporate and labor money to flow into elections, unlimited money straight out of their coffers. So, what—our entry point into this film was when we saw Citizens United now advocating for free speech. Citizens United is a right-wing organization in Washington that we had had a run-in with through our work on Fahrenheit 9/11. They actually filed a complaint with the FEC to block the trailers for that film from airing in the run-up to George Bush’s last election. And so, when we now saw them on the side of free speech, we were kind of suspicious. So, we wanted to look at how this was going to play out in the next election cycle. Governor Scott Walker of Wisconsin was elected in 2010, which was the first election cycle where this money was flowing through outside groups at unprecedented levels. And as we started making the film, Governor Walker—there was an uprising in Wisconsin, essentially, in response to Governor Walker’s attacks on collective bargaining. So we were just drawn to Wisconsin to see how this was going to play out on the state level. And this is the journey that took us to where we are today. JUAN GONZÁLEZ: And, Tia, you focused on Americans for Prosperity. Could you talk about the group and its relationship, obviously, to Koch? TIA LESSIN: That’s right. Well, Americans for Prosperity is the chief political organizing arm, I guess, of Charles and David Koch. They founded the organization. They fund the organization. We don’t know quite how much money they get from the Kochs, because much of that is undisclosed. But they’re out there on the ground in states, in Wisconsin and throughout this country. They call themselves a 501(c)(4) social welfare organization. They also have a foundation arm. They were doing political organizing and election advocacy. And I suspect that the majority of their work is that, but it’s hard to tell, because we—you know, they don’t need to disclose all their campaign spending. But we ran into them quite a bit in the run-up to the recall election. They were spending a ton of money on the ground. I think Tim Phillips, the head of Americans for Prosperity, admitted that he spent at least $10 million to help, you know, shore up Scott Walker and fight the recall. But what we came to understand, the—Walker’s efforts to bust the unions was not—it’s not about fiscal crisis in Wisconsin. It wasn’t about pension reform or healthcare. It was an attempt by the extreme right to disenfranchise working people and take out their political funding for the Democrats, for Scott Walker’s opponents. JUAN GONZÁLEZ: Well, you mentioned that Americans for Prosperity are a social welfare 501(c)(4), which is a timely issue because your film, Citizen Koch, also relates to the recent complaints by right-wing groups that the IRS unfairly scrutinized their political spending. The groups reportedly tested rules limiting political activity for certain tax-exempt organizations by sponsoring political ads and organizing members to campaign in recent elections. Tax rules prevent social welfare groups from participating in elections as their primary activity. I want to turn to a clip of Tim Phillips, a conservative political strategist and president of Americans for Prosperity, which claims to have spent $10 million in Wisconsin during 2011, ’12, and reported spending another $36 million to defeat President Obama in 2012. This is Phillips speaking four days before the vote on whether to recall Governor Walker. TIM PHILLIPS: Madison, you know, the days of the liberals, of the left, having this massive infrastructure that overwhelms us are over. It’s a new day. Today, you are the model for the country. And what we’re saying in Wisconsin, through the tea party and Americans for Prosperity and everyone else and all of you, we’re saying to every governor and every state legislature, if you do the right thing, we got your back. We’ll be there for you. We’ll deliver the message with you. Frankly, we’ll raise the money, and change is a lot of it. But we’ll raise it, and we’ll put up TV ads and radio ads. We’ve got your back. JUAN GONZÁLEZ: That was Tim Phillips, president of Americans for Prosperity, speaking four days before the vote on whether to recall Governor Walker. This is another clip of Phillips from the film Citizen Koch. TIM PHILLIPS: Let’s make sure that we do our part to move this state forward and to keep moving it forward. Thanks for all you’re doing. AMERICANS FOR PROSPERITY VOLUNTEER: Here’s a phone for you. Hanna will tell you how to get on the system. AMERICANS FOR PROSPERITY VOLUNTEER: Thank you very much for your time. I urge you to go to Americans for Prosperity. TIM PHILLIPS: No, of course not. It doesn’t impact us at all. We don’t do election advocacy. TIM PHILLIPS: Again, Citizens United impacts Americans for Prosperity in no way, shape or form. INTERVIEWER: This is not election advocacy? JUAN GONZÁLEZ: That’s an excerpt from Citizen Koch. For our radio listeners, members of the Americans for Prosperity in this clip were all wearing green T-shirts that said “November is coming.” Your—the importance that you were focusing on the political activity of Americans for Prosperity in the film? CARL DEAL: Yeah. Well, we just observed what we saw, and we presented it in the film. And, you know, if there was ever any doubt over exactly what Americans for Prosperity is up to in Wisconsin, I think hearing Tim Phillips rallying the tea party and saying, “If you do the right thing, state and local officials, we’ve got your back”—now, this was one of the interesting things that we learned along the way is that, you know, Citizens United had an impact on the federal election, there’s no doubt, on federal election spending, but it’s also part of a state-by-state strategy that’s loosened up the activities of these sort of dark money outside groups that are—there’s really very little accountability for, to operate on the state level, as well. And so, that’s what we saw there. Keep in mind that Americans for Prosperity itself is a corporation. So, to some extent, it also is freed up by the decision in Citizens United, as are the corporations that donate money to Americans for Prosperity to sustain its political work on behalf of various candidates. AMY GOODMAN: Now, one of the very interesting aspects of the film is a lot of the people you speak to in this film are not the traditional opponents, for example, of someone like Governor Walker. He’s a Republican, so you’d be interviewing the Democrats. But it’s the Republicans themselves. Let’s go to a clip of one of the Republicans you feature in Citizen Koch, who’s concerned about the role of money in elections. This is Mari Jo Kabat, a lifelong Republican and Christian conservative, who lives near La Crosse, Wisconsin, where she and her husband raise cows. MARI JO KABAT: I don’t want big money from out of state with a slick ad influencing me. I consider myself a fairly intelligent human being, and I can figure things out for myself. You up for petting tonight? We figure if a back massage feels good to people, it probably feels good to cows, too. I always thought the Republican Party was the party of the people, the common man. And that’s what I am. And that’s why I voted Republican. I don’t think the Republican Party represents what it used to represent. The most important thing that the Republican Party stands for that I will always support and always agree with is the right to life. AMY GOODMAN: In this clip from Citizen Koch, we meet Dee Ives, an Air Force veteran and proud Reagan Republican, who works as a registered nurse in Wisconsin and is a member of the Service Employees International Union, or SEIU. In this excerpt, she is collecting signatures to recall Republican Governor Scott Walker in that recall—leading to the recall vote. DEE IVES: A lot of people say, “Dee, you’re a Republican. How can you recall a Republican?” It’s like, Governor Walker is a tea-partier. Tea party and Republicans are not the same thing. And I personally do not espouse the tea party principles of cutting government service in order to balance our budget. It is not working. RETIREE: Yeah, get rid of that guy! Walker is a bully. And I was a union man. And if it wasn’t for the union, I couldn’t have retired. I would have worked ’til I was a hundred. COUNTY WORKER: Both my wife and I are county workers. And when I took the job, I took a pay cut for benefits, and I’m losing my benefits. So, yeah, it’s hit us hard financially. UNIDENTIFIED: How you been doing? DEE IVES: Really good. We only have 900 people in this town, and we’ve already got about 50 signatures at this point. AMY GOODMAN: Republicans talking about their effort to recall Governor Walker. Ultimately, he prevailed, and he survived that recall vote. Tia Lessin? TIA LESSIN: With a $36 million war chest and tens of millions of dollars of spending from outside groups. And, you know, in seeing these clips, I just want to say, ITVS and PBS took away our broadcast on public television. That stifled our voices, but it also stifled the voices of these working-class Republicans who have a lot to say to America. And it makes me sad that their voices won’t be heard on public television. JUAN GONZÁLEZ: And, Carl, what’s your expectation in terms of how you’re going to get the film out now, given this setback in terms of ITVS and PBS? And also, what does it mean about the future of public broadcasting in the United States? CARL DEAL: Well, you know, we’re exploring every available avenue, including community screenings. It’s a really effective way to get the message out. It’s a really effective way of helping people organize. You know, but what this all says about the future of public broadcasting, I think, is that public television should be funded with public money. There’s more accountability there. You know, every time that a politician goes after Big Bird, there is a public outcry, you know, probably often from working parents who need that hour of quiet time in the morning with Sesame Street. But, you know, there is some accountability that you just don’t get with private—with the private involvement. And that’s not to say that people shouldn’t be making their pledges and making their donations and participating in the conversation in that way, but it certainly shouldn’t be beholden to private interests. AMY GOODMAN: I wanted to end with a statement issued by the Koch brothers in response to how Jane Mayer reported on what happened to Citizen Koch, Jane Mayer who wrote the piece in The New Yorker. The statement said, “When Ms. Mayer called Koch for comment, a few days prior to publication, she made no mention by name of the film called 'Citizen Koch,' which she discusses at length in her piece, relying in part on comments from far-left wing propagandist Michael Moore. Instead she simply referred to 'a documentary' that had been under consideration at WNET. We did not know what film she referred to and, had she been forthright and direct and asked us about it, we would have told her that Koch made no effort to dissuade WNET or anyone else from airing it.” Your final comment, Tia Lessin? TIA LESSIN: Well, it’s just like how they operate in our electoral system. They give a lot of money. They don’t have to specify their demands. The politicians know what their agenda is, and they serve that agenda of the Koch brothers. And the same thing goes with public television, apparently. They made their contributions, and the programmers pay attention, and they make their programming decisions based on that. It’s really sad, but I think Carl is right, we just need to advocate for more public moneys for public television. AMY GOODMAN: Where will Citizen Koch air? TIA LESSIN: Well, you can check out our trailer on citizenkoch.com, on our website. You can request community screenings. And we are scrambling right now to find a new distributor. And, you know, wish us luck. AMY GOODMAN: Well, I want to thank you both very much for being with us, Tia Lessin, Carl Deal, Academy Award-nominated filmmakers for the film Trouble the Water. Their new documentary, Citizen Koch. This is Democracy Now! When we come back, we’re going to be talking about hunger in America. Stay with us.